It's summer and this is traditionally the time when every school, community group and local institution decides to hold an annual fun event to bring the community together and perhaps raise some money. I have tried to list all such festivities going on within the bounds of KT4 but please pardon me if I miss any! 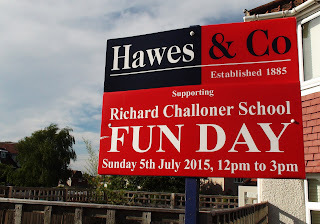 With this in mind I should alert you to the Richard Calloner School Fun Day tomorrow (Sunday 5th) starting at 12 midday at the school, at the other end of Manor Drive (or this end - depending on where you are). I understand there is a to be a Rugby theme this year with rugby based activities with prizes every hour and a classic rover competition. Also there will apparently be lots of fun activities for all the family including a bbq, DJ, tombola and huge inflatable bouncy thingys. The cost of entry is £1.